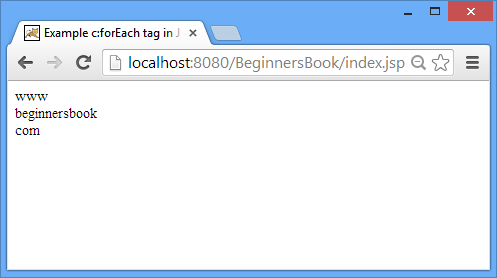 <c:forEach> tag in JSTL is used for executing the same set of statements for a finite number of times. It’s similar to the for loop in java. This is basically used when we need to perform(execute) set of statements again and again for a specified number of times. <c:forTokens> is also used for iteration but it only works with delimiter which means using this tag we can break the input data into multiple parts based on the delimiter. We will understand this with the help of an example in this post. The below are the three main attributes of <c:forEach> tag. begin: The initial counter value. 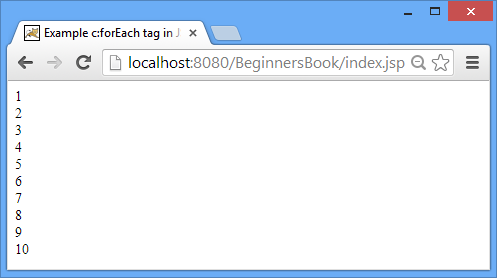 In this example we are printing value of variable counter in loop using <c:forEach> tag. The loop is starting from value 1 (mentioned in begin attribute) and ending at value 10 (value of end attribute). The below are the three main attributes of <c:forTokens> tag. items: Set of data value(s). delims: The delimiter can have any value. It can be a number, string or special character. var: variable name which stores the sub strings. In this example we are splitting the strings into multiple substrings using delimter dot(‘.’). I shall be grateful if you guide me further. You gotta import the library (take jstl.jar , copy and paste it to the lib folder under WEB-INF, finally right click it and select ‘Build Path’->’Add To Build Path’).